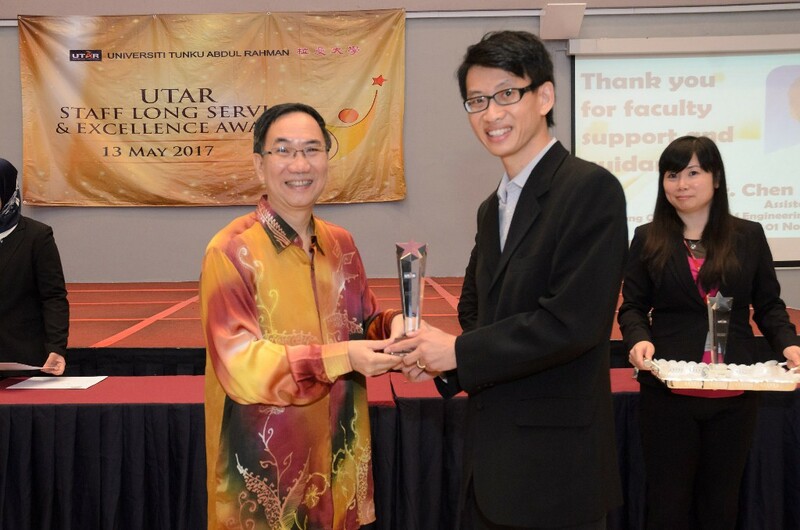 The UTAR Staff Long Service and Excellence Awards 2017 was held at UTAR Kampar Campus for the first time on 13 May 2017. 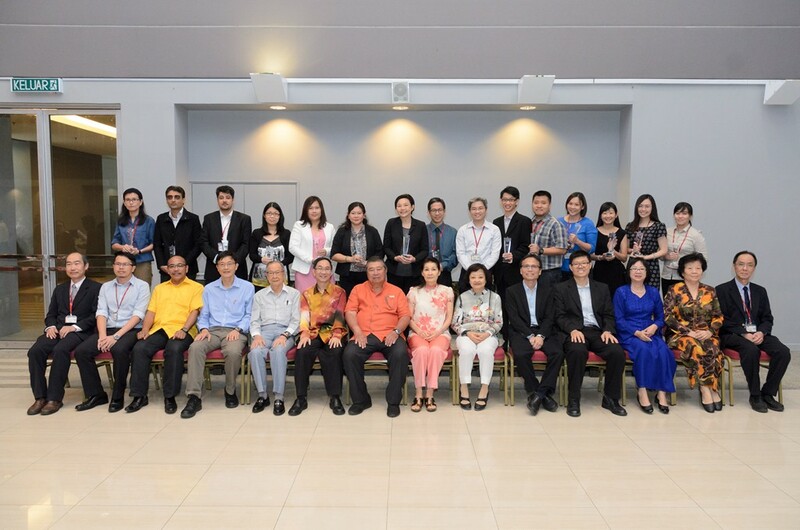 An annual event to reward those who have served the university for a decade and to acknowledge the academics for their excellent teaching and research endeavours as well as the administrative staff for their service excellence, the ceremony was graced by UTAR Chancellor Tun Dr Ling Liong Sik. He was accompanied by his spouse Toh Puan Ena Ling, UTAR President Ir Prof Academician Dato’ Dr Chuah Hean Teik and UTAR Council Member Hew Fen Yee. Also present were UTAR Planning and Development Committee Advisor Tan Sri Hew See Tong and spouse Puan Sri Woon Mun Fah, UTAR Vice Presidents Prof Ir Dr Lee Sze Wei and Prof Dr Choong Chee Keong, Registrar Yim Lin Heng, Division of Human Resource Director Wong Lee Lan, Dean of Faculty of Science Assoc Prof Dr Lim Tuck Meng, Dean of Faculty of Engineering and Green Technology Assoc Prof Dr Yap Vooi Voon, Head of Department of Student Affairs (Kampar Campus) Chiang Jeng Fong, Head of Department of Safety and Security (Sungai Long Campus) Zainudin Bin Mustaffa, and Head of Department of Alumni Relations and Placement Foo Wai Wai. Citing UTAR’s success as a concerted effort, Prof Chuah commented that despite being a young 15-year-old university, UTAR still manages to produce over 48,000 graduates and have more than 26,000 students. “This year, we have also been ranked Top 120 by Times Higher Education (THE) in Asia University Rankings; Top 150 in THE Young University Rankings and 14th in the Young University: Millenial category. This is indeed a miracle made possible following the support from the general public, students, alumni and staff,” he continued, and reminded all to not rest on their laurels but work innovatively and diligently to stay ahead. 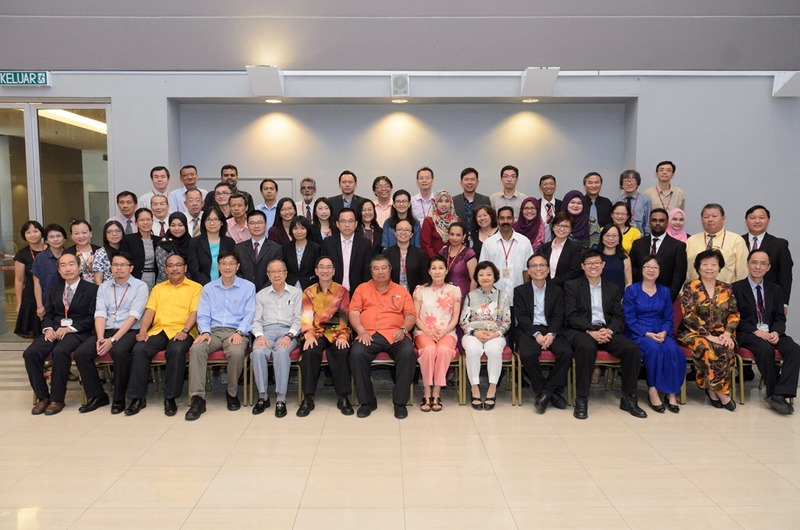 Prof Chuah also extended his appreciation to the university’s Board of Trustees, Council, Vice Presidents, Deans, academic and administrative staff, and stakeholders for their support. 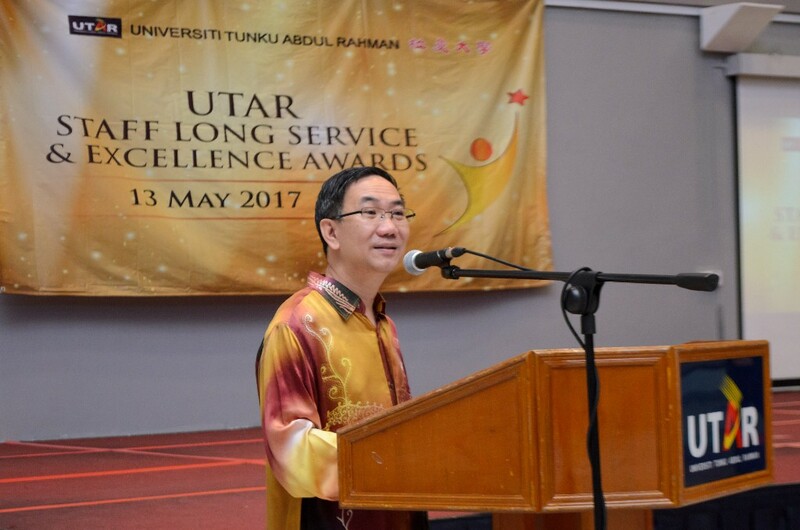 Describing great employees as four-leaf clovers which are “difficult to find but lucky to have”, Tun Ling also congratulated the award recipients and thanked them for their passion and hard work invested since UTAR’s inception. “To the Excellence Award recipients, it’s heart-warming to note that you have embraced opportunities, overcome the challenges and attained positive results that have culminated in today’s award. To the Long Service Award recipients, like wine, we are more refined and smoother as time goes by. 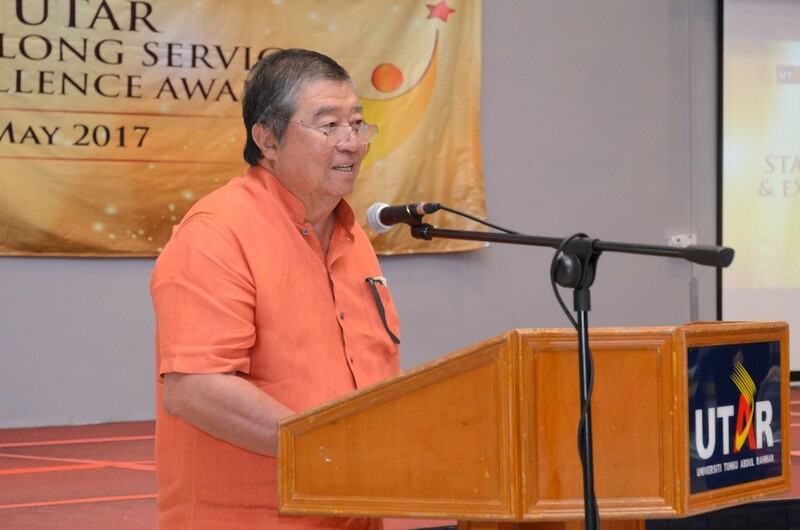 Hence, we must continue to adapt to changes and be better with each year that passes,” remarked Tun Ling. The ceremony reached its highlight with Tun Ling, accompanied by Prof Chuah, presenting the awards to the recipients of the Long Service Award from both Kampar and Sungai Long campuses. 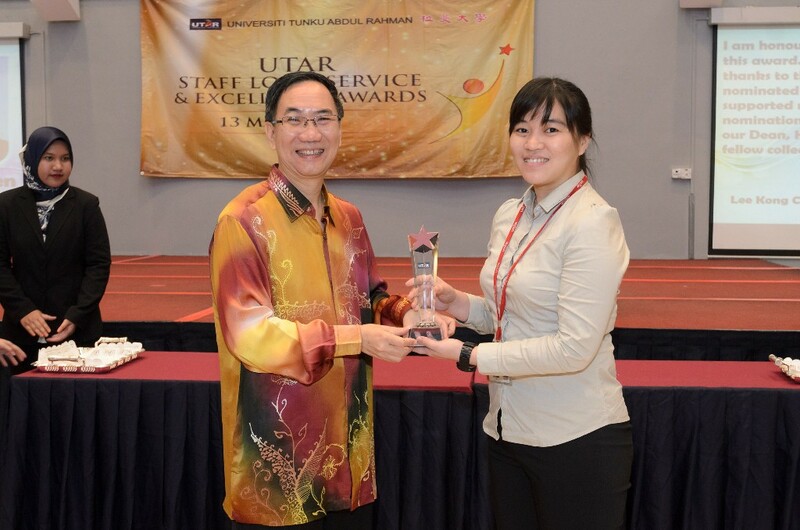 Long Service Award recipient Chiok Phaik Fern who joined UTAR on Valentine’s Day in 2005 said the date reminds her of the beauty of falling love with the organisation. “I like UTAR as it appreciates the talents and willing to go the extra mile to equip academic staff with the cutting-edge knowledge and skills to excel and advance in the higher education. To UTAR, I’m delighted to be part of your success story,” enthused the Faculty of Arts and Social Science lecturer. Click here to read the testimonials from the Excellence Awards winners. 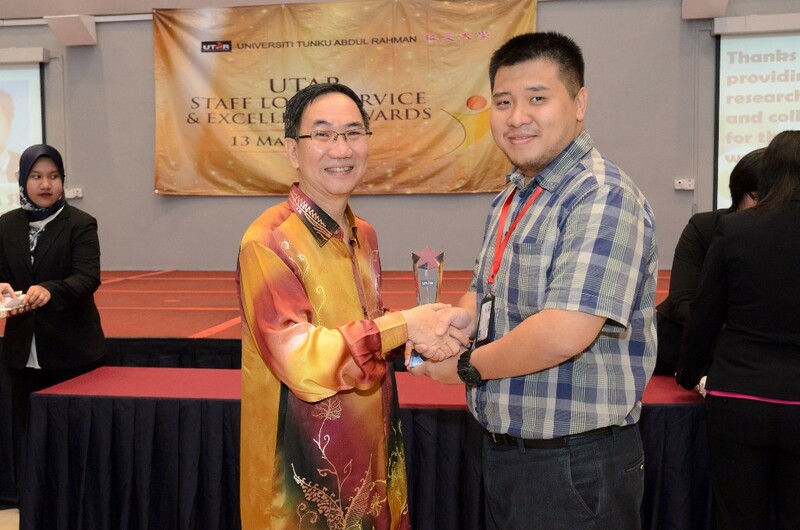 Curtains were drawn on the UTAR Staff Long Service and Excellence Awards 2017 following a group photography session and luncheon.